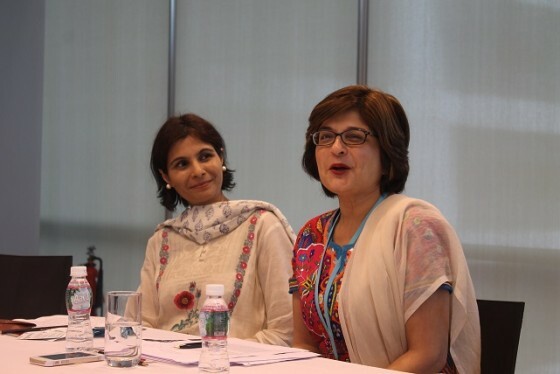 MUMBAI, August 6, 2014 — Asia Society and Bloomberg hosted Farahnaz Ispahani, politician, writer, women and minority rights advocate and Public Policy Scholar at the Woodrow Wilson Center as part of its Women of Asia series. In a private, off-the-record roundtable discussion, Ispahani opened the conversation with a brief about her new book, in which she spoke about the country’s growth, ethnic marginalization, and societal development. Optimistic about Pakistan’s future, Ispahani asserted that regardless, democracy is a bumpy and slow process. The Q&A session was ascended towards women rights, and the challenges women face in rising to leadership positions. To improve the number of women in leading positions the focus should remain on those at the work/mid-levels rather than those who have already reached the top. Though many Pakistanis desire change, a collaborative effort by men and women alike in the South Asian region needs to be had in order to make a progressive transformation. How can glass ceilings be shattered in traditional societies? Ispahani went on to say, only when we educate our society to change the mindset and narrative, Pakistan will see the change it so desperately needs. However, education itself cannot be the be-all, end-all; the challenges intersect, and laws must also pass that protect the rights of women. Only when these laws are passed, those in authoritative positions may implement them, and there can be a sense of duty and accountability. Ending on a positive note, the invitees decided it was time to build an online platform for women and girls from the SAARC nations to allow them to share their thoughts, ideas and opinions various issues concerning women-some might call it a hopeful step forward. This programme is part of Asia Society India Centre’s Women of Asia Series, which brings eminent women from the fields of Asian business, arts, culture and policy, and provides a senior level platform for discussion on issues of current interest affecting Asia and the world. This series promotes the collaboration and leadership of accomplished women through a range of informative and network building forums that facilitate the sharing of best practices, critical issues and personal experiences.